Even if the idea of wrapping fillings in dough and cooking up the tasty bundles wasn’t invented in Poland – more likely it was imported to Europe through Russia from China – pierogi are Poland’s pride and joy and probably the most recognisable Polish dish around the globe. It now seems this global spread is causing new varieties to pop up that are revolutionising people's perception of what pierogi can be. For the uninitiated among you, let’s start with the name itself, since it seems to cause some confusion among English-speakers – when you say pierogi, it’s already plural, no need to add that extra ‘s’. If you’re only talking about one dumpling, the singular form is pieróg (pronounced ‘pye-roog’). The etymology of the world is unclear, though the ethnologist and linguist Aleksander Brükner has traced its origins to the Proto-Slavic word pir, which means ‘a feast’. The word is found in recorded evidence dating back to the 17th century, but the dish likely made its way to Polish territories much earlier. 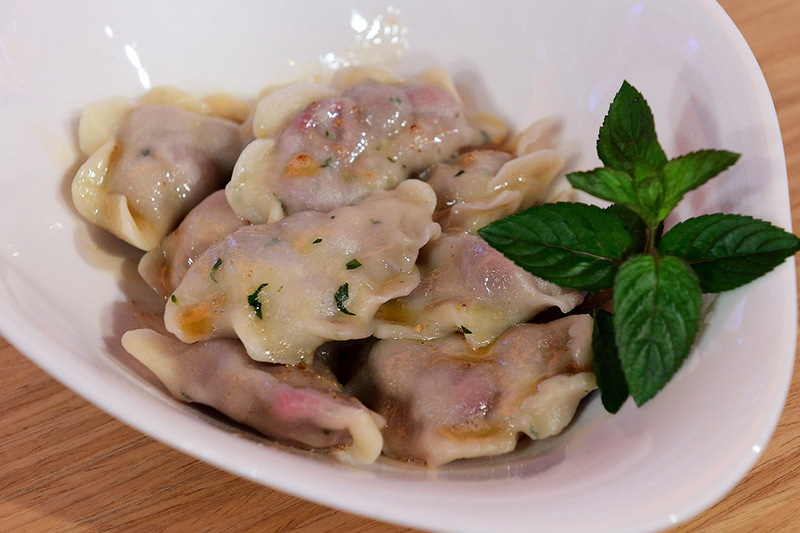 Legend has it that the 13th-century saint Jacek Odrowąż introduced pierogi to the nation when he fed dumplings to the poor in Kraków following the Tatar invasion. Since then, he is sometimes known as ‘Saint Jacek with pierogi’. At first, these savoury, stuffed treats were only made on special occasions and took many forms: kurniki are extra-large dome-shaped pierogi filled with poultry, groats and mushrooms, made mostly for weddings; knysze, a type of baked pierogi filled with buckwheat groats, cheese or potatoes were once a fixture of funeral rituals and are so popular in American Jewish communities that they pop up in the films of Woody Allen as knishes; sanież and socznie are a sweet variety prepared for name day parties. A miniature version – known as uszka (‘little ears’) – are filled with mushrooms and served with borscht (barszcz) and feature prominently in Polish Christmas Eve dinners. Sauerkraut pierogi are also a popular dish at Christmas, though they are enjoyed all year round – and they have been for quite some time.The oldest Polish cookbook, Stanisław Czerniecki’s Compendium Ferculorum – published in Kraków in 1682 and recently rereleased by historian Jarosław Dumanowski – features recipes for pierogi with veal kidney and sweet pierożki, a yeast-based version filled with rose and elderflower preserves. 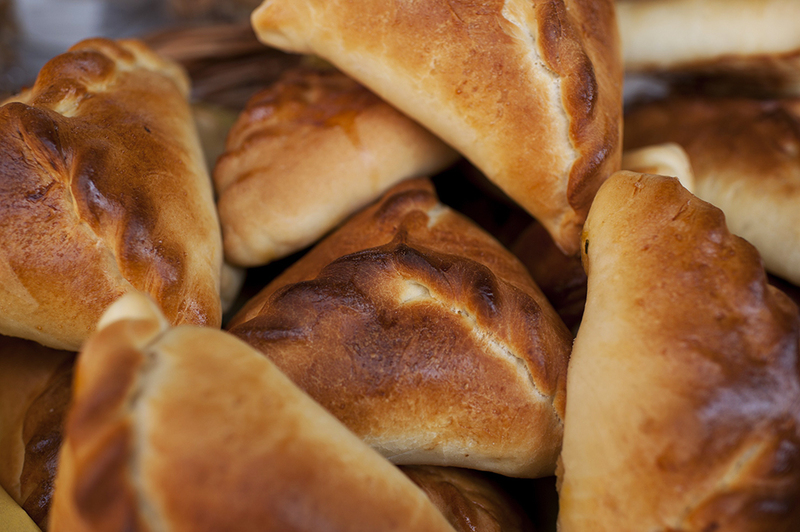 Pierog: Pirog, general folk name for every baked yeast pastry. In old Polish cuisine, they were divided into various types. Some were made from rolled pastry stuffed with cheese or meat. The famous Tatar kolduny were made of raw pastry filled with raw mutton and a bit of lard, ingeniously prepared so that the meat is well-cooked and the pastry holds in the juices from the meat and fat. (…) Pierogi ruskie, yeast pastry filled with cheese or jam, are well-known, as are Lithuanian pierogi, which are filled with sauerkraut. All of these are now part of Polish cuisine. While the basic concept endures, some things have changed in the last 150 years. Pierogi ruskie are now made with a cottage cheese (called twaróg or biały ser, white cheese), potatoes and fried onions. The other ‘classics’ – sauerkraut with mushroom and meat – are still a quintessential part of Polish cuisine, but now are most often made from a simple dough (just flour, water, and perhaps an egg or some milk), boiled and served with fried onions or pork scratchings. This ‘holy trinity’ of flavours is still the most popular, but Poles are also open to experimenting with new fillings, often drawing inspiration from other cuisines. Spinach and feta is now a very common combination, chanterelle filled pierogi are a seasonal treat, and even salmon and white fish are finding their way in gourmet fillings. As veganism becomes more popular, tofu, fava beans, millet and pumpkin are being used to replace cheese and meat. At last year’s pierogi festival in Kraków a combination of duck and apricot took first prize – awarded in the form of a statue of Saint Jacek with pierogi. 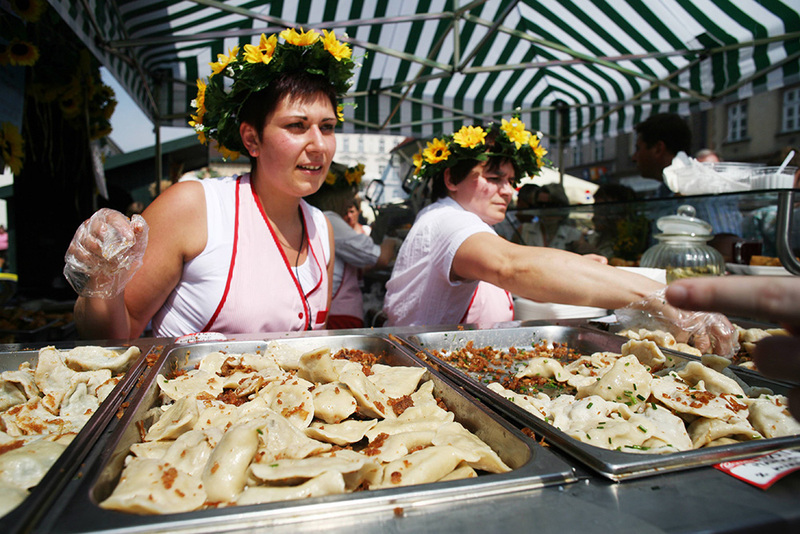 There are also a number of combinations that might seem strange, but are actually traditional regional recipes: in Lublin, mint is added to the filling of buckwheat or lentils; semolina pudding (kasza manna) fills the dumplings in Podkarpacie; and the Tatar village of Kruszyniany in Podlasie still makes the traditional steamed kartoflaniki with potatoes and egg and jeczpoczmaki with potatoes, meat, carrots and parsley. While Poland boasts great variety, some of the craziest pierogi flavours and spectacular traditions were born abroad – mostly in the US and Canada, where the dish has been made famous by large Polish and Ukrainian immigrant populations in places like Chicago, Buffalo and Detroit. There are pierogi festivals in Lawrenceville, Georgia and Whiting, Indiana where you can eat your fill of dumplings (both traditional and ‘American’ flavours like sweet potato or cheddar and jalapeno) and mingle with fun characters like Miss Pączki and Polkahontas. Pittsburgh is a strong contender for the title of ‘America’s Capital of Pierogi’ with its Great Pierogi Race organised by the Pittsburgh Pirates baseball team. The race is sponsored by Mrs. T’s, American’s biggest pierogi manufacturer, and features six contenders: Potato Pete, Jalepeno Hannah, Cheese Chester, Sauerkrakut Saul, Oliver Onion, Bacon Burt and Pizza Penny. Mrs. T’s was opened in 1952 by Ted Twardzik, who wanted to make his mom’s dumplings available to the masses. Pittsburgh is also home to… the chocolate-covered pierogi – the traditional cheese and potato dumpling, but dipped in chocolate! Pierogi are also quite popular in Canada. 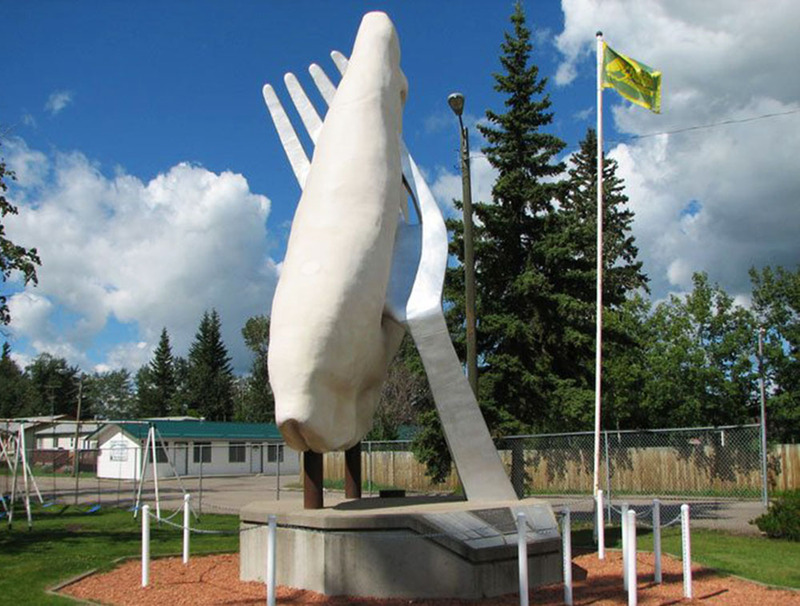 So much so, that in 1993, Glendon, a small village in Alberta, unveiled a roadside tribute to this Eastern European favourite – a statue of a pieróg on a fork, called the Giant Perogy (yet another way North Americans spell the name). For some, eating good pierogi is a spiritual experience. For Donna Lee, in Point Place, Ohio, it quite literally was – in 2005, she saw the face of Jesus on a pierogi she was preparing for Easter dinner. She didn’t eat it – obviously – and decided to sell it on eBay. 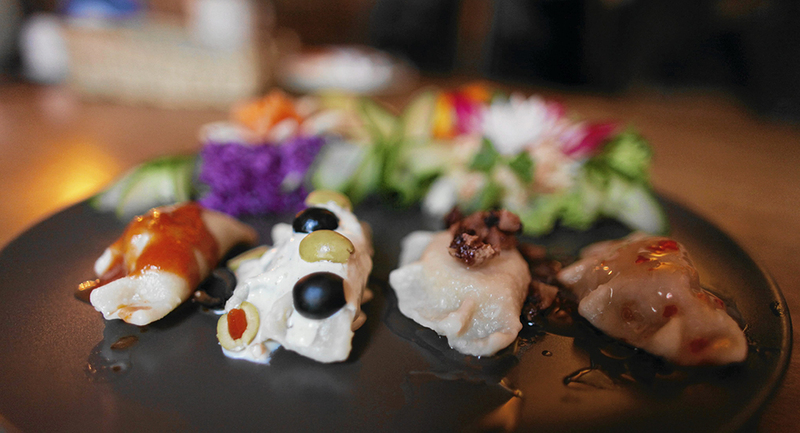 The $1,775 she got for the dumpling is just proof that pierogi are a real treasure!